» Could Banksy have shifted the 2017 UK Snap General Election? It’s not often when art and politics converge as in the short lived Banksy UK Election Souvenir Special, which began on June 4th and abruptly ended on June 6th in a swell of anti-election-rigging furor. Banksy offered a free limited edition artwork for voters who sent photo evidence of not voting for the Conservative candidate in the Avon constituencies of Bristol North West, Bristol West, North Somerset, Thornbury, Kingswood and Filton. It would seem that with 650 seats in Westminster that Banksy intended to pursue a meaningless gambit––but could his ploy have potentially affected the outcome? It appears that Banksy thought so, since five of his targeted seats voted Conservative in the 2015 election, and those seats represented the exact number of Conservative losses needed to kill their 330 seat majority. Sure Banksy’s move may have been a longshot at best, but let’s look more closely at his strategy. 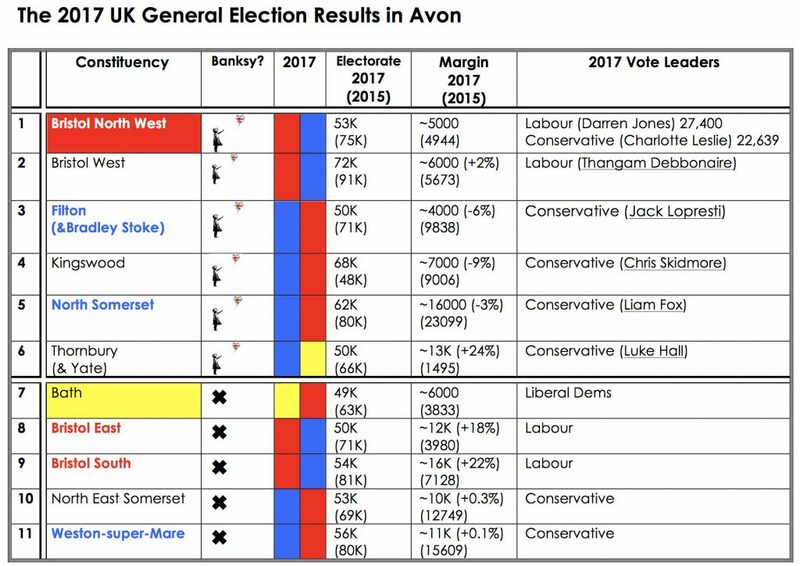 The chart below was sourced from the Wikipedia entry for the voting district of Avon, (where Banksy’s hometown of Bristol sits in the center–or he’s more likely this guy––and better here) and a pre-election article from the Bristol Post. Voters in constituencies labeled 1-6 would have been eligible for the Banksy promotion while the voters in the remaining areas would not. The column labeled “2015” shows the party which won the constituency in the 2015 election along with the runner up. The “Electorate” displays the number of registered voters, while the margin shows the number of votes by which the majority vote getter won the 2015 election. So for example, Bristol North West has roughly 75,000 registered voters, and they voted in the Conservative candidate Charlotte Leslie with the Labor Party’s candidate trailing by 4944 votes (7% of the electorate). Fairly strong Conservative strongholds that have not voted Labor in over 20 years and the new solidly Conservative voting Filton regions appear in blue text. Solidly Labor strongholds for the last 20 years or more appear in red text. The chart clearly shows the motivation for Banksy’s region selection since he primarily targets constituencies with a Conservative incumbent in the hopes of shifting the vote towards alternative candidates, presumably with the intention of forcing more Labour victories. The Wikipedia Historical Representation by Party chart allows us to tease out a few of the exceptions to this pattern, but the historical vote still leaves a few puzzles. 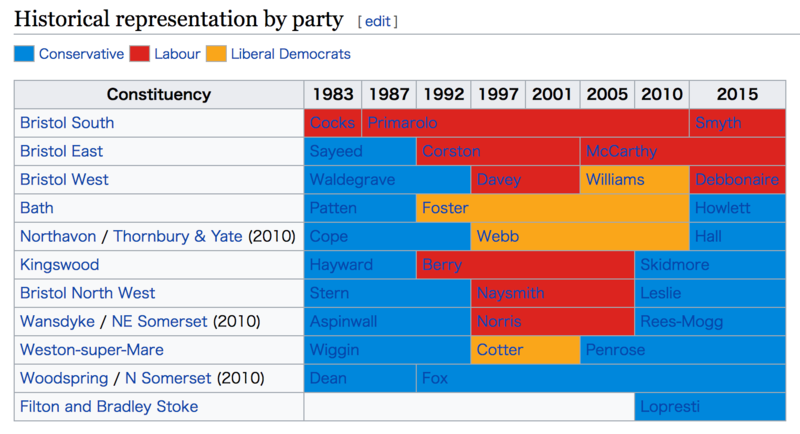 It’s not clear why Banksy would extend his offer to Bristol West since they haven’t voted in a Conservative candidate since 1992 and it seems to be shifting further left with the Greens––perhaps Banksy wants to reward some of his friends? 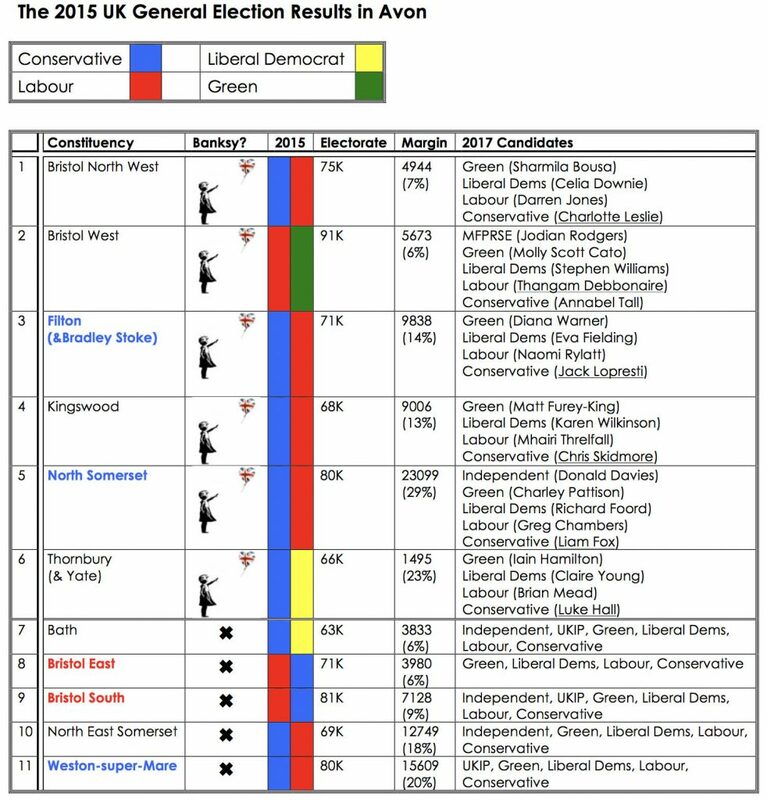 And while the exclusion of the traditionally non-Labor Bath and Weston-super-Mare (ironically home of Banksy’s Dismaland) make sense, the exclusion of North East Somerset remains a mystery since it has a bit of Labor voting history. North East Somerset would serve as a far more realistic target than North Somerset, which has been voting solidly Conservative since 1983. It’s possible based on local information and/or local polls that Banksy had reason to believe that the Conservative constituencies that he chose were the most vulnerable. The 2017 results below somewhat support Banksy’s distribution since all of the blue non-print-receiving constituencies, except Bath, remained stable, while all the blue print-receiving constituencies lost at least some Tory votes with the exception of Thornbury. 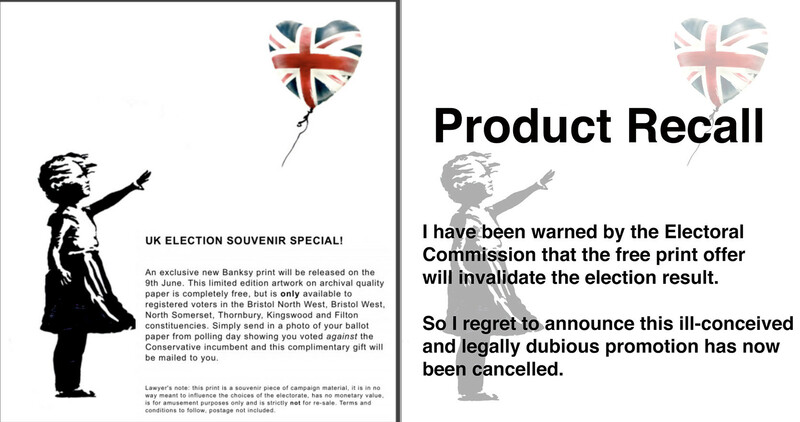 So setting aside the legal and ethical considerations, assuming that the Banksy UK Election Souvenir Special would have influenced the vote within the constituencies, could he have shifted enough votes? Considering the fact that Banksy has demonstrated the ability sell out large print runs in minutes––and a version of his most iconic print is on offer––and that even an unsigned Banksy edition can potentially be worth thousands of dollars––and that even an extremely large edition of unsigned, and perhaps unverifiable Banksy prints would still likely sell for hundreds of dollars––it is safe to assume that a high demand would exist. Although I’m setting up a huge after the fact hypothetical in an environment in which the UK election has a resulted in a hung Parliament, I will use the election results to see how many more votes Banksy would have needed to shift his desired seats. The 2017 Election chart below based on results from the Bristol Post and the BBC website shows that two seats in Avon changed hands, Bristol North West to Labor and Bath to the Liberal Democrats––this resulted in a two seat loss for the Conservatives. For the remaining four seats important to our question, did Banksy’s promotion have any swing potential? In general, the Conservatives took a shellacking and won by smaller margins in three Avon constituencies and only had a noticeably more robust victory in Thornbury. The Conservatives as the incumbents were already losing popularity and this election marks a significant shift in the electorate. The Banksy seat margins in favor of Conservatives were: Filton +4000 (+8%), Kingswood +7000 (+10%), North Somerset +16000 (+26%) and Thornbury +13000 (+26%). It appears that the possibility of Banksy directly shifting the 2017 UK General Election remains somewhat of a nothing-burger. The percentage of the electorate that needed shifting in the zero hour of the election presented an extremely high bar that even the legendary Banksy would have been very unlikely to achieve. *Perhaps some believe that a 10% shift by Banksy is achievable based on his unusual stature in the art community; however, let’s compare his potential shifting power to an analogical event. In the 2016 US Presidential election, the ground shifting Comey letter possibly shifted the US election about 3%, likely among voters on the fence. In light of that result, it would be highly unlikely that the Banksy promotion could shake up the UK election to anywhere near 10%, especially since Banksy needed to prevent those in the Tory electorate from voting Conservative.